Sweet crimson-colored beets, tender baby greens tossed with a hint of cilantro, slices of creamy avocado, supremes of juicy blood orange, slivers of crunchy radish, and a chop of candied walnuts, all dressed with a citrus champagne vinaigrette... beautiful ingredients that work well together for a bright, colorful, sweet-tart, fresh salad. But... truth be told, it was the opportunity to carve those little beets, shaped whimsically as quintessential chocolate kisses, that drove its making. I'm a detail girl and, sometimes, it's simply the details that win me over. While I'd love to take credit for thinking up those little carved morsels, they were actually inspired by a texted image I received of a dinner that was had at Maverick in San Francisco, several weeks ago, miles from me... and my kitchen. That particular plating took a more minimalistic approach with cylindric-like towers of turnip and a restrained dusting of grated cheese. It was also served with a sweet little bowl of beet soup... a bowl whose stark white porcelain stood in perfect contrast to the rich rose hue of the soup and whose shape just subtly mimicked that of a heart; a lovely, understated presentation. I will take credit for the little message... written on a bit of parchment (those little beets just begged for that). Oh... those darling beets! They really are the perfect little orb for carving, with your imagination being your only limitation. Preheat oven to 375 degrees F. Lightly wash and dry beets. With hands, lightly rub beets with olive oil (using gloves is recommended when handling beets, as they are quite staining). 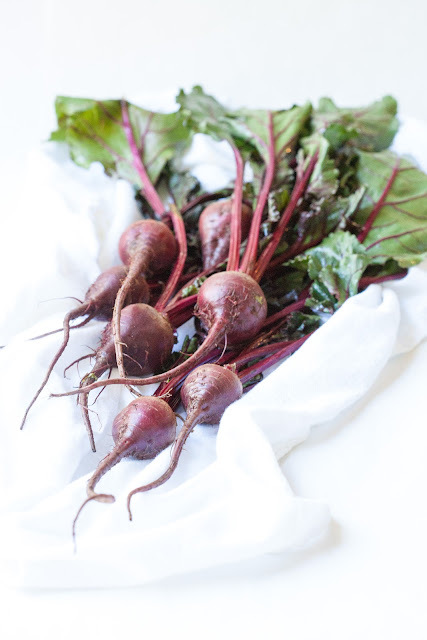 Wrap each beet in a piece of foil and place on a parchment-lined baking sheet. Bake for 30 to 35 minutes, until fork tender. Remove and let sit until just warm to the touch. Remove foil and carve beets to desired shape, removing skin as you work (covering work surface with parchment or wax paper... and wearing gloves... will make clean up easy). Set aside carved beets. Combine orange juice, lime juice, honey and champagne vinegar in a small bowl. Lightly whisk in olive oil to combine. In a large bowl, combine baby greens, cilantro, radish, and orange supremes. Lightly dress greens with vinaigrette and divide salad among two plates. 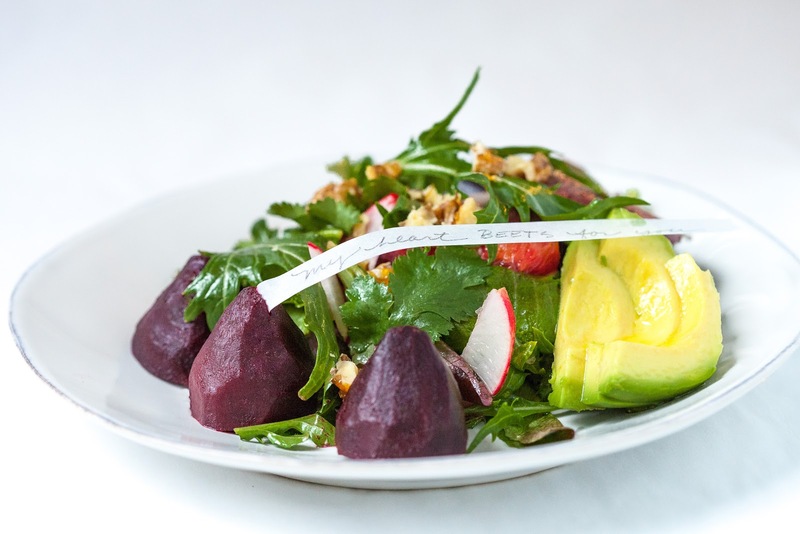 Place a few slices of avocado along side of each salad, along with three carved beets each. Top with a sprinkle of candied walnuts, if preferred, and serve. Note: to make candied walnuts, heat 1/2 cup granulated sugar in a non-stick pan over medium high heat. Gently stir sugar with a wooden spoon, until it is almost completely melted, being careful not to splatter it as it is extremely painful if it touches your skin. Add 1 cup chopped walnuts to melted sugar and stir to coat. Turn off heat and continue stirring until nuts are well coated. Transfer nuts to a piece of parchment paper. Holding sides of paper, gently rock nuts along paper to prevent sticking. They will cool quickly into one block. Once completely cooled, nuts can be chopped to divide.